Live la dulce vita with this creamy, dreamy, caramel-y Dulce de Leche Cheesecake. It's the height of dulce de leche deliciousness! Beat cream cheese and 1/4 cup sugar in large bowl with mixer until blended. Add dulce de leche and sour cream; mix well. Add eggs, 1 at a time, mixing on low speed after each just until blended. Pour into 9-inch springform pan sprayed with cooking spray. Meanwhile, cook remaining sugar in medium saucepan on medium heat 4 min. or until melted and golden brown. Remove from heat. Stir in cereal; spread into thin layer on baking sheet. Cool. Top cheesecake with COOL WHIP and cereal mixture just before serving. For variety, omit the cereal topping. 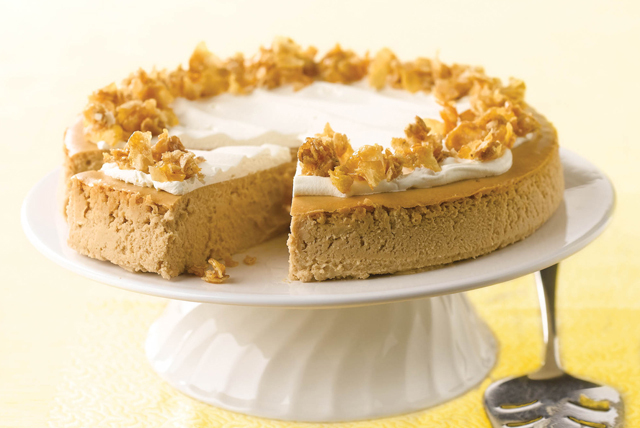 Prepare your favorite graham cracker crust recipe; press onto bottom of springform pan. Top with cheesecake batter and bake as directed. Store cereal topping, uncovered, at room temperature until ready to use.